Here is an open letter to a buddy I hung out with in grade school and early junior high. His name was Keith Berry, and his full name was Keith Wayne Berry. He lived in Lawton, Oklahoma, until seventh grade, when he and his family moved to the Dallas area. I haven’t had any luck finding him via web searches. I felt like we were pretty good friends, and I’d like to locate him. Here are a few Keith stories. Keith loved John Denver, and even cut his hair like Denver’s. Keith and I formed a club, which he named “Filler Paper,” since we would immediately have free, custom stationary. Keith and I played war using tennis rackets, which we turned handle-forward to look like rifles. Keith and I made a number of audio tapes, including Keith Berry’s Top of the Roof Show, Scenic America, and Variety Pack. I still have that audio, in MP3 form. Keith and I played a lot of chess. I am putting this out into the ether in the hopes that Keith does a vanity search and gets in touch with me. I would love to hear what he’s been doing since 1977. If you are Keith, leave a comment. This is an image of Keith Berry when we were in sixth grade, 1975. The dog is Ladybug. I’m not Keith; sorry. But now I’m silently awaiting the first news reports of middle school kids being suspended for carrying their tennis rackets handle-forward, imitating a gun. 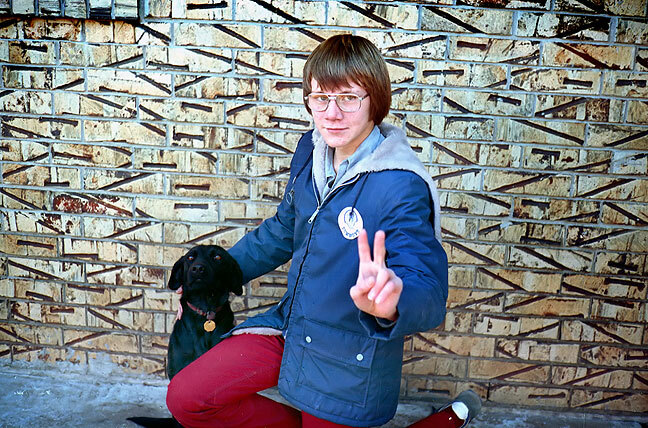 Fun sidebar: our junior high school principal, Abe Deutschendorf, was John Denver’s uncle.